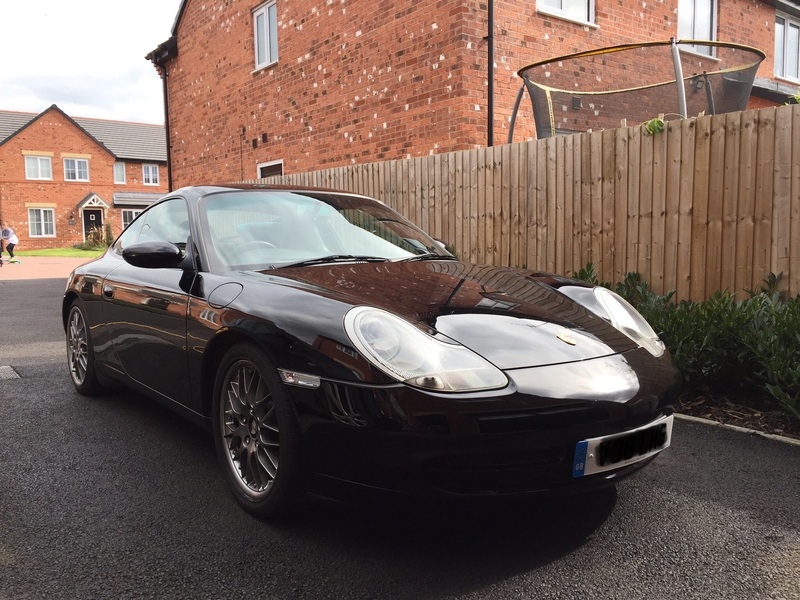 After lurking on here for a while I took the plunge on a 99 Carrera 4 last week. Picked it up on Saturday and ticked off a 30 year old ambition to get a 911. Only issues so far is I’m getting a few rattles from the suspension which I suspect is ARB link and bush related, and also a big vibration from the rear wheels, tyres are nearly dead so I suspect it’s a balance issue. Here she is, black with a space grey interior, which I’d not seen before but really liked it. Don’t get to close to it and it looks okay, it’s peppered with stone chips though but it was bought to be driven so I’m not too fussed about that. Congrats and we’ll wear. There is plenty on here about suspension and tyres.i changed all my links and dampers last year. Kept it all standard. It completely transforms the feel of the car - not just from a rattle point of view, the ride is much more supple. to 911 ownership at last. Looks great on those wheels. Don't see many in black. Looks superb. Almost 4 years is quite a while to be lurking. You’re right, I was living down under when the thought entered my head that I may be able to get one when we came back to the UK. Hence the long time lurker status! .... I was living down under when the thought entered my head that I may be able to get one when we came back to the UK. Probably anything between 3 and 4 times what I paid for it over here, European cars are just expensive full stop in Oz. It was also always cheaper to buy parts from Europe for the Landrover, despite paying £100 for postage. The upside being that a 30 minute job usually took that because there was no rusted up bolts etc. I've never been that fussed about living in a sunny climate but that is certainly 1 massive attraction. Must be so good to work on a car without dealing with rust. Black with grey trim looks good. People always whinge about grey interiors but I honestly like how light and airy they feel. My most favourite car I’ve owned was a 964T in red with grey trim. Loved that car and I really liked the interior. Enjoy and good luck sorting the niggles. It’s half the fun. Yeah, I enjoy sorting niggles out, and there’s no pressure to get this one working again for Monday mornings either!